Summer is all about enjoying the sun and entertaining outdoors, which also means pesky mosquitoes and other bugs will be on the attack. Kristin Appenbrink, Associate Editor for RealSimple.com tells us how to keep those bugs from becoming a issue while enjoying the outdoors. There are many ways to prevent and control mosquitoes from swarming your food and your guests at your summer party, it's just a matter of understanding each insect as well as the best products and strategies for bug protection. Mosquitoes gravitate to bodies of water, are attracted to body heat and moisture, and are at their worst at sunrise and dusk. 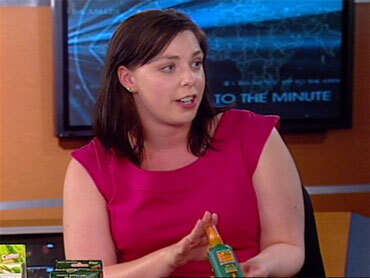 Insect repellents that contain DEET work well on individual bugs. DEET is a highly effective chemical that wards off insects, but doesn't kill them. There is some concern that it is toxic, especially with children. Luckily there are plenty of DEET-free products out there that are equally as effective at repelling mosquitoes. One product to try is the Off! Clip On Mosquito Repellent, available from Drugstore.com This is the repellent you don't spray on. A quiet fan circulates the repellent all around you and each refill provides up to 12 hours of head-to-toe mosquito protection. You can clip it to your clothes or set it next to you. It's great for relaxing in your backyard, at the beach, at the park, gardening, camping or watching sports. Natrapel 8-Hour Deet Free Insect Repellent Wipes, available from Drugstore.com is another product to try. It's effective DEET-Free insect protection in convenient, individually wrapped wipes. Apply them to exposed skin for protection against mosquitoes. The Cutter Lemon Eucalyptus, available from Amazon.com, is a natural product to try. The Centers for Disease Control and Prevention found that oil of lemon eucalyptus naturally repels mosquitoes and ticks. The black-legged tick that spreads Lyme disease is common in the northeast and upper Midwest, where it hangs out in the woods. They are attracted to blood and can feed off your skin for up to 72 hours. It is very important to wear long pants and sleeves if you'll be in the woods or around tall grasses. Always check your skin after a romp in the woods, and if you find one, remove it slowly with a tweezer. See a doctor if you develop a bull's eye-shaped rash or flu-like symptoms. Defense against ticks is just like that against mosquitoes and there are a lot of double duty products that repel both, including DEET sprays. Additionally, all-natural products work as well. If you're reluctant to put bug spray on your little one you have options. Buggies Clothing, available from BuggiesClothing.com, has an adorable new line of children's clothing made to repel bugs. It's the only one of InsectShieldTM apparel for infants and toddlers that keeps children covered and protected against a variety of bugs, including those that carry Lyme disease and West Nile virus. InsectShieldTM uses a man-made version of a natural repellent found in certain types of chrysanthemum flowers. Avon Skin So Soft Bug Guard Plus IR3535 Expedition SPF 30 pump spray, available from Avon.com, contains the amino acid IR3535 that the CDC found to repel ticks and mosquitoes. Repel Lemon Eucalyptus Insect Repellent, available from Amazon.com, is just like the Cutter Lemon Eucalyptus repellent, this all-natural product repels ticks and mosquitoes for up to 6 hours. There are many kinds of bees, wasps, hornets, and yellow jackets whose nests are found in trees or bushes, under the eaves of buildings, or even on the ground. Bees and yellow jackets are attracted to sweet things, while honeybees like the colors of flowers. The best way to avoid getting stung is to simply leave them alone. Swatting at them only makes them angry. But, there is something you can try, Wasp Traps, available from Amazon.com. These wasp traps double as outdoor decorations for your next garden BBQ. Simply put the lure and water inside the glass and hang from a tree or hook. Fire Ants love warm places and live in mounds. They are omnivores so they will eat anything from leaves to baby birds. If a nest is threatened, they will attack by injecting venom that feels like a burn. They are nearly impossible to kill. There are chemical products on the market that can help you control fire ant populations, but they won't kill them. We've heard that grits, bleach, or Drano can help, but again they won't eliminate the problem. For more information on bug protection visit RealSimple.com realsimple.com.